The University conducted the examinations on November 2018. 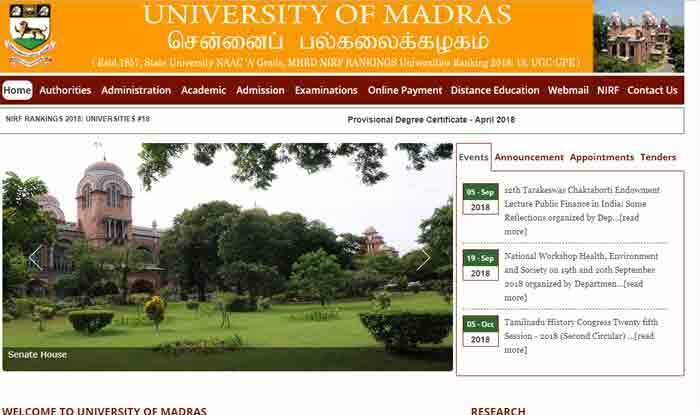 Madras University UG/ PG Results 2018: Madras University is expected to announce the results of the Undergraduate, Postgraduate degree examinations by Friday i.e., February 8, 2019. Candidates who had appeared for the examinations are requested to check their results on the official website, i.e., results.unomac.in. Results can also be checked at ideunom.ac.in and egovernance.unom.ac.in. Step 1: Log on to the official website – results.unomac.in. Step 2: On the top of the homepage, click on the link which says, ‘UG/PG/professional degree examination results – November 2018′. Step 3: Enter the required details such as your registration number. Step 4: Click the ‘Get marks’ icon. Step 5: Your marks will be displayed on the screen. Now download the same and take a printout for future reference. The University conducted the examinations on November 2018. Candidates who need revaluation have to pay a required amount of fee per paper. The university had released the November 2017 results in the last week of January 2018. The Madras University released the UG PG Revaluation Results 2018 on June 26, 2018. The exams for the same were conducted in April 2018.